Sponsored by: Helmedach & Young Inc. 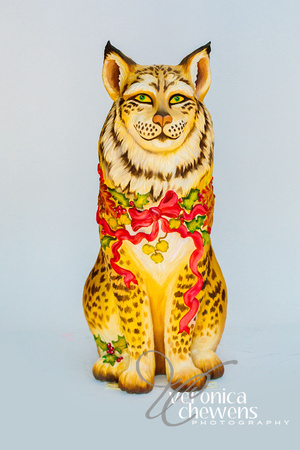 Description: Winter Bobcat with garland of pine and bursts of ribbon and berries to add color to natural painted cat. About the Artist: I am a graphic designer and decorative artist who loves to create works in various mediums – I’m happiest with a brush in hand, covered in paint. 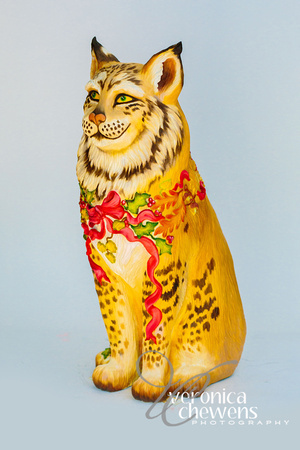 My career has been primarily focused on graphic design and photography, but I also worked at Louis Paul Jonas Studios as a fine art detail painter of wildlife sculptures. My craft hobbies include creating hand-painted furniture, beaded jewelry and historical costumes. My avocation in life is rescuing cats, and my husband and I run a non-profit cat rescue. This is my sixth year participating in Cat ’n Around Catskill, it’s a wonderful creative outlet for me and all my proceeds go toward our rescue.